Selina has taken the plunge. She's moved from her home and into a unknown city to further her art career by studying under the famous Albert S. Seligmann. The only problem is Professor Seligmann is a pretentious jerk and Selina must give it her all to prove she is worthy of his teachings. Chronerion Entertainment's A Fragment of Her is a creative narrative told through a point-and-click view. While you can play the Unity demo online, you'll need to download the game to play it all... don't worry, it's free! 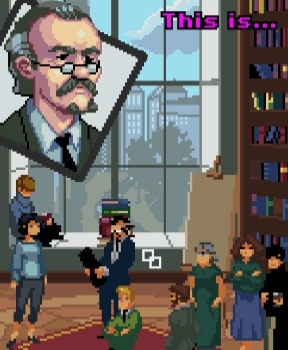 In this free indie adventure you help Selina find the knowledge and education to better her artwork and attempt to gain Professor Seligmann's approval. But the longer Selina tries the more she begins to doubt the ability of this high and mighty Art Master. Though a little on the short side and the fact that it ends when things just begins to keep a little deeper, you'll be thrilled to hear there is a sequel and a big promise of many more to come. It won't take long before you realize that A Fragment of Her is kind of like a pilot for a TV show. It introduces characters, gives some hints of the main heroine's mysterious background and is easygoing... well, until it's not. It's like getting a small piece of a fabulous cake... you enjoyed it, but you really, really need more. It's played like a point-and-click game, clicking on objects with a description to read more about said item, but there aren't any logic puzzles, or searching for the right item that needs to be given or placed in another area. There are some of these "puzzles" but the game pulls you through all the hoops. It tells you the answers and hands you solutions whether you want it or not. But this first part of a hopefully long series isn't about the gameplay, it's about the story. If you go into it expecting a tale and ready to read more than play, then you're going to be able to enjoy this game to its full potential. And with its demo that can be played in the browser there isn't a reason to pass up this with out getting a little taste of it first. Hey! I'm interested but can I know what the subject matter is that's upsetting before I play? Yes, sorry, you beat me to it. she is attacked on screen and there is a struggle, but she gets away before anything beyond that happens. Thanks to both of you for telling me! I appreciate the details, and I like that your site warns people about stuff like this. Okay, I just finished both A Fragment of Her and its sequel (link on game developer's page under the Games menu). The review was spot-on. I have little to add except that I really felt for Selina, and I really wish there had been alternate endings to the second chapter. I hope there's a third and it comes out soon! Thanks! I'm glad you enjoyed it. I played the first game when it was only the demo and forgot about it till the sequel came out. When I went back to play the first all the way through I had a bigger appreciation for it.